The structure of a bean seed is simple, but the plant sprouting from the seed is complex with large fruit yields. According to the U.S. Department of Agriculture, beans contain significant levels of protein, which is why they fall into two groups within the USDA’s food pyramid: the “meat and beans” and “vegetables” categories. The USDA also states that beans contain numerous minerals and vitamins, making them a valuable addition to your diet. The testa is the hard outer “skin” of the seed. Although not a part of the internal structure of a bean seed, the testa is vital to the well-being of the seed. The testa protects the internal elements of the seed during its dormant phase, before germination. 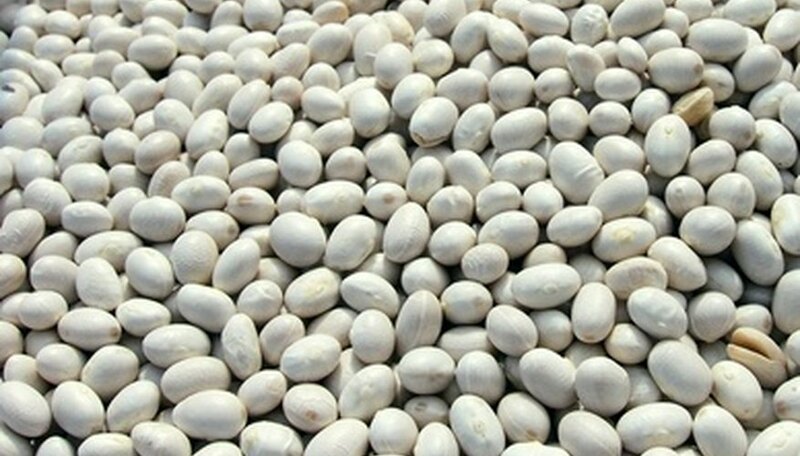 The color of the testa varies according to the variety of bean seed. Situated on the testa, at the indented portion of the bean, the micropyle is a small hole that allows water to enter the seed to start the germination process. Cotyledons provide nutrients to the developing bean plant from the time of germination until the roots have matured enough to sustain the growing plant. The cotyledons are the two large halves of the seed beneath the testa, between which the embryo is nestled. The embryo is split into two halves, the radicle and the plumule. The tiny embryo is situated between the cotyledons and is the immature bean plant. The radicle is the initial root of the bean plant, and it makes up half of the embryo. Once germination has begun, the radicle descends through the micropyle into the soil, where it continues to mature, developing a complete root system. The plumule consists of the first leaves and the growing tip of the bean plant, and it makes up the second half of the embryo. Once the radicle has passed through the micropyle, the plumule expands and pushes upward, breaking through the testa and ascending until it reaches daylight. The hypocotyl is part of the plumule, situated between the cotyledons and the root. The hypocotyl is the immature portion of the stem, which becomes the main stem and support for the mature bean plant. Located below the leaves of the plumule and above the cotyledons, the epicotyl is the second half of the immature stem of the plumule. As germination begins, and the plumule ascends from the seed, the epicotyl elongates, reaching toward sunlight, in a process referred to as phototropism.